Goodies shared by your fellow Expresii users. To load a new Color Preset set, simply go to Colors tab>Preset Menu>Whole Set>Load, to load the .CFG config file. You will need to switch to Advanced User Mode to reveal a 'Texture' panel under Paper Material tab. 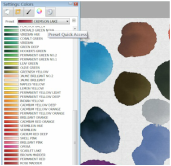 Create a new preset, and then choose your own paper texture file (JEPG only) in the texture panel.